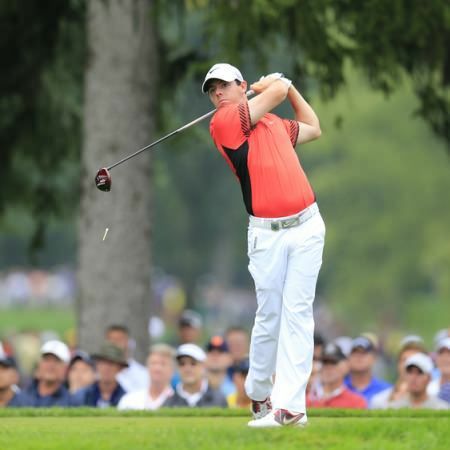 Rory McIlroy gets his US PGA title defence undereway. Picture: Eoin Clarke/www.golffile.ieRory McIlroy is no longer a shadow of his former self but a recognisable outline of the genuine article again after he showed more than a few sparks of his old brilliance to open with a one under 69 in the US PGA at Oak Hill. 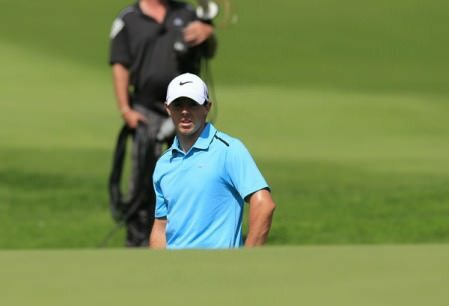 Tied for 22nd after a one under par 69, McIlroy closed with a gutsy par four, gouging his second onto the front of the 18th green in fading light before holing a six footer for par after coming up short with his approach putt. It would have been a travesty had he failed to break par having raced to three under after four holes of a weather delayed opening round. His three putt bogey at the 17th was unlucky in that he hit a glorious eight iron, hooking the ball 25 yards in the air to get around a tree blocking his view of the green. But his putt at the last showed all the bravery we’ve come to associate with McIlroy with his best and on a day when Darren Clarke also chiseled out a 69, it was a good day for the Ulstermen all round. “It definitely isn’t what it could have been but it was good,” McIlroy said. “I was happy with the first nine holes, had a couple of bogeys on the back nine early but got it back with a nice birdie on 12. It was a good round of golf. A solid start. Asked about taking the next step of turning a three under par front nine into a really low round, he said: “Yeah, it is. It’s about capiltalising on that great play and getting the most out of it. Instead of getting to three under through four and going back to one under, it is keeping the foot on the pedal, I guess, and getting to four under, five under, six under. The world No 3 got off to a sensational start, racking up three birdies in his first four holes to get within two shots of leader Jim Furyk. He was back to one under par after back to back bogeys at the 10th and 11th but he was showing signs of a return to top form despite some careless mistakes. After ripping a 320 yard drive at the first and a firing stunning short iron to three feet, he hit his tee shot to four feet at the par-three third and then birdied the par-five fourth. A duffed approach into water forced him to hole a six footer just to save bogey at the fifth but he bounced back. A birdie from 15 feet at the ninth saw him turn in 32, just two shots behind Furyk and tied for fourth. Darren Clarke makes sure he avoids treading on his player partners’ lines at the 18th. Picture: Eoin Clarke www.golffile.ieBut then came back to back bogeys as he found greenside rough at the 10th and 11th and couldn’t get up and down. Facing a 12 footer for birdie at the 12th when play was suspended, he returned and holed the putt to get to two under again before that late bogey at the 17th threathened to undo all his good work. 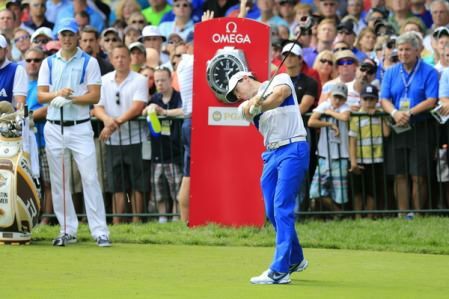 “Today was definitely positive,” McIlroy said. “I felt like I played really, really well. I didn’t play so well coming in, but I thought for the first holes it was really good. 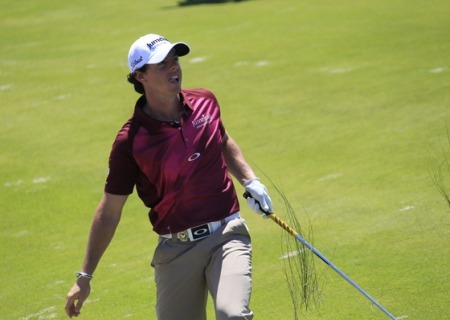 McIlroy is four shots adrift of leaders Jim Furyk and Adam Scott, who shot 65s on a day when 35 players broke par. “Yeah, you know, you don’t need to be particularly long on this golf course,” McIlroy said of the wide range of players in red figures. “It’s no surprise Jim is up there. I mean, it is a course that is tree lined. It gives you a nice visual off the tee boxes and off greens. Ryder Cup captains Tom Watson and Paul McGinley shake hands on the 18th. Picture: Eoin Clarke www.golffile.ieClarke would not concede that he had played well alongside Ryder Cup skippers Tom Watson (73) and Paul McGinley (78) but he could have few complaints. 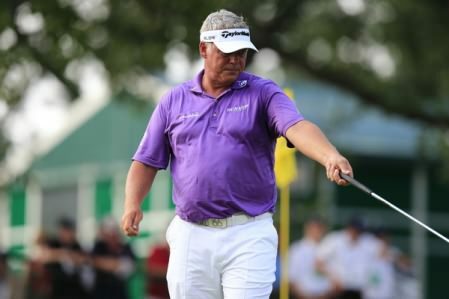 Clarke was the leading Irishman in The Open at Muirfield and with Dr Bob Rotella again helping him with the mental game, he’s threatening to better than performance. “I spent a lot of time with him at The Open and spent a lot of time with him again this week,” he said of Rotella. “Whenever I am over here, get the opportunity and at The Open, he was over there. McGinley was going well until he missed a short putt on the 12th and never recovered, confessed that he was undergolfed and unable to step up hsi golf on a tough track. “I played really well for the first 12 holes and went to tap in a putt from 14 inches and missd it. 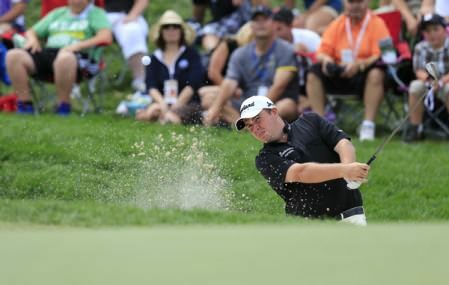 I never hit a shot after that,” McGinley said. “It knocked the stuffing out of me. “That put me three over and I doubled the next hole, chipped it behind a tree, and three putted the next. It’s a big step up becuase first of all I haven’t been competitive and secondly I haven’t played a golf course as tough as this. That’s as tough a golf course as I have ever played. It really was brutal. It wa sa challenge and I knew it was going to be a challenge but I will re-group for tomorrow.